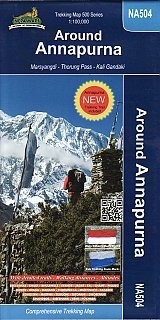 Detailed 1:100,000 scale map of the whole Annapurna circuit, including information on recenlty opened routes. Going from a height of 800m to 5500m this map covers the 9-21 day route. The route goes via Besi Sahar, Chame, Manang, Ledar, Thorung La, Muktinath, Tatopani, Beni, Pokhara.